Enjoy the quickest shipping and the lowest authorized prices on Ekornes Stressless Office Chairs. Now is a great time to save $100's on select Stressless Office Chairs. Supply is limited so call 888-486-9463 or click the Chat button (top of page) to learn how your next Ergonomic Office Chair can be delivered nationwide with pricing that simply cannot be matched. The Unwind Company is proud to provide the best value on all of our office chairs and healthy furniture. Our large nationwide inventory includes frequently stocked items, special order colors and configurations, and hard to find colors and combinations for many models. These are all processed and ready to ship as quickly as possible. For most locations in North America, we can ship nationwide to your home in a matter of days. For fast-shipping items, we typically ship orders in 1 business day of ordering. If you want to learn more about additional expedited shipping options for any item, drop us a line at 888-486-9463 and we will be able to provide a variety of options, guaranteed to suit your needs. If you know which item(s) you are looking for and are ready to order, our team of dedicated Ekornes’ Brand Specialists, can process your order over the phone in a flash. We do our best to help you save money and simplify the shopping process. At Unwind, your time is valuable. That’s one of the many reasons we offer multiple Fast Shipping options. Visit your preferred Stressless Office Chair product page. For all Office Chairs you will need to select a wood stain for the base. Follow the on-screen instructions to complete your checkout and you’ll be relaxing comfortably in your new Stressless Office Chair(s) very quickly. Once your order is completed, you will receive an email confirmation. Our dedicated Customer Service Team will typically contact you within 1 business day to verify your order details and provide an ETA. Have Questions or Prefer to let us do the typing? Drop us a line at 888-486-9463 or 1-601-932-5111 and place your order over the phone. Our team can have your order processed in a flash and send you a confirmation instantly. In addition to the world’s most comfortable furniture, we want to help you relax and unwind by offering a 30-Day Satisfaction guarantee. Please review our entire Shipping & Returns policy online under the Customer Service Tab for complete details. We have 100s of options in-stock for immediate shipping. 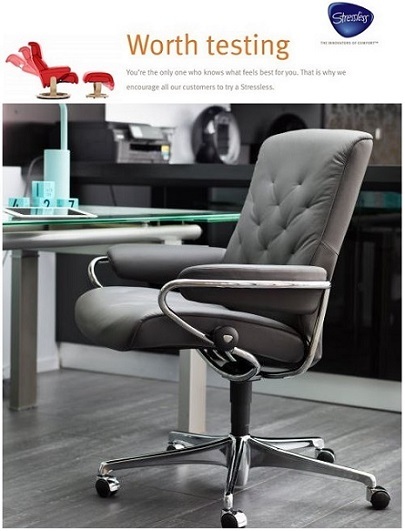 Take advantage of our large inventory of Brand-New Stressless Office Chairs and our A+ rating with the Better Business Bureau. You can instantly order online and have your Office Chair shipped to your business or home office. Ekornes® offers four different types of leather and 12 types of fabrics, each in a full range of colors. This ensures there is a perfect match waiting for you. Call 888-486-9463 and place your order now. It's a great time of year to purchase from the most-comfortable, back-healthy furniture brand in the world- Stressless by Ekornes! Stressless office furniture delivers unsurpassed head, neck and back support and the smooth, supportive, cushoning allows you to sit at your desk undeterred for many hours on end. They Look and Feel Like Ekornes Stressless Recliners - because they are Stressless Recliners. Experience full-body comfort at work or in your home office. Ekornes has taken ultimate comfort to a new arena, so that you can enjoy real Stressless comfort while working. 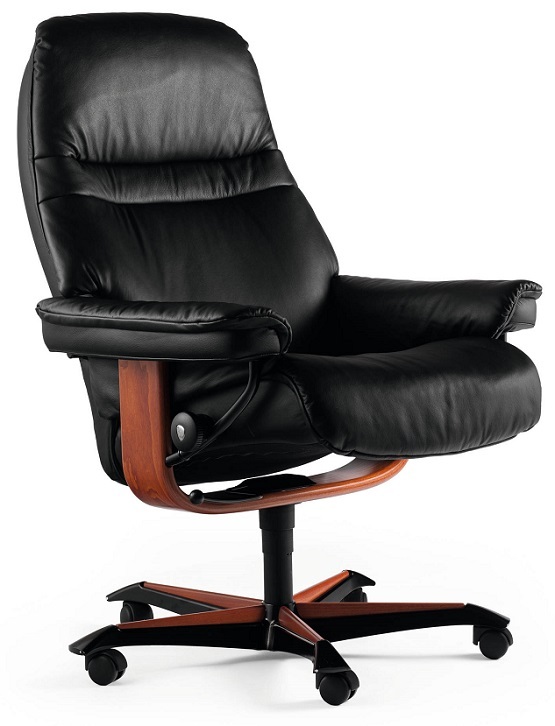 We have tons of new Ekornes Office Chairs in stock for fast, safe nationwide delivery! Stressless Office Chairs & Recliners arrive fully-assembled with Full Manufacturer's Warranty and our Money Back Guarantee. Choose Fast Nationwide In-Home/Office White-Glove Delivery - Select White-Glove Delivery when you order your back-saving Stressless Office chair from Unwind.com and we'll bring your chair inside and even set it up (we'll even take the packaging when we leave). Call 1-888-486-9463, click the chat button, or email stressless@unwind.com to connect with a Stressless Office Chair Specialist.